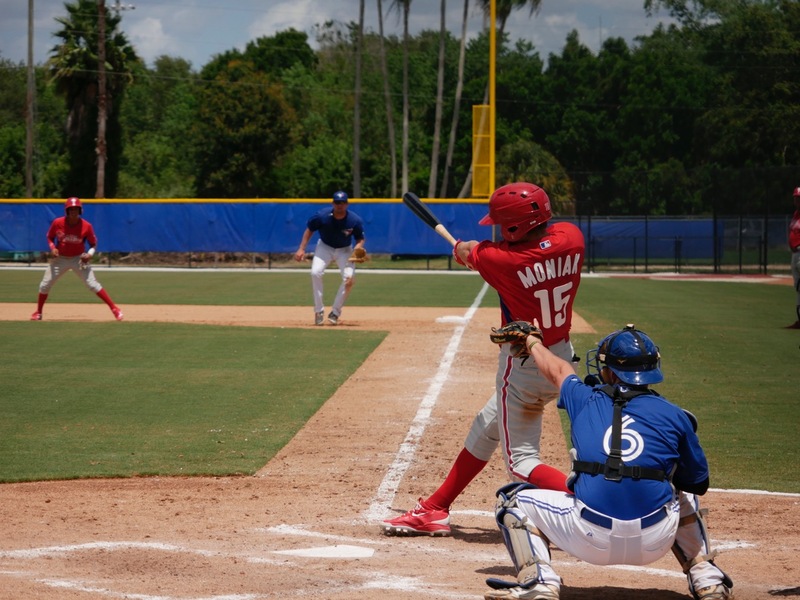 The two hottest teams in the organization won again behind strong pitching performances by Seranthony Dominguez for Lakewood and Mauricio Llovera for the GCL Phillies. JoJo Romero pitched a strong six innings for Williamsport but the Crosscutters were unable to take advantage. 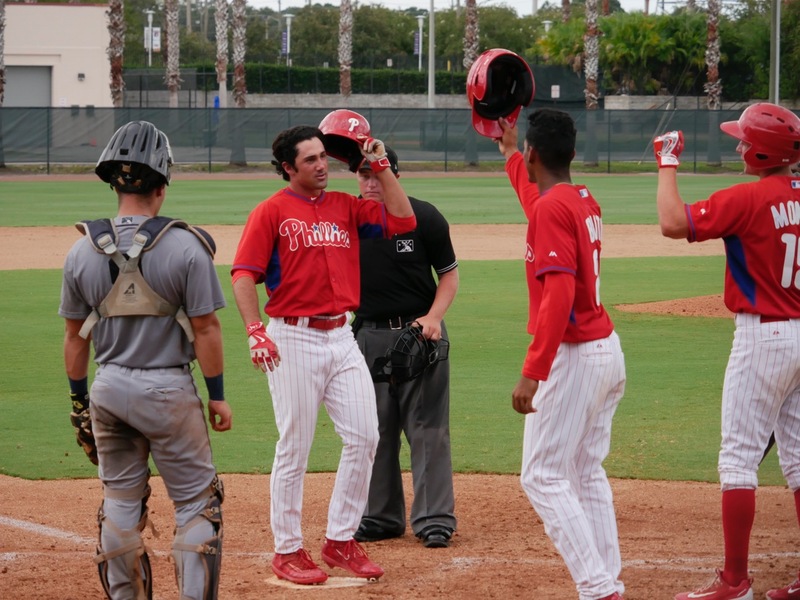 The most dramatic offensive highlight was Josh Stephen’s two-run home run that provided the late inning runs the Phillies needed to extend their winning streak to seven games. Lehigh Valley (78-55) Lost to Pawtucket, 4-3. David Buchanan (8-9, 4.23) Gave up all four of the Bisons runs in 5.0 ineffective innings. Colton Murray (3.06) loaded the bases with one out in the sixth, and was relieved by Joely Rodriguez (3.77) who stranded all three runners with an inning-ending double play, and retired seven batters in 2.2 innings. Unfortunately the IronPigs couldn’t make up all of the three run deficit. Andrew Knapp and Cameron Perkins each had two hits including a double. Cody Asche hit a 2-run HR (5) in the seventh. Brock had the other RBI on a one-out single in the fourth. Reading (83-48) Lost to New Hampshire, 5-2. Tom Eshelman looks like he’s still trying to find his equilibrium in Reading. He walked 3 batters in 5.0 innings (the third time this season he surpassed 2 BB in a game). His metrics are all above those that got him promoted from Clearwater to AA. Last night he gave up 3 runs (2 earned) on 4 hits and only struck out one. Joe DeNato (3.86) retired 4 of the 5 batters he faced and walked one. Alexis Rivero (4.61) gave up 2 runs after not allowing a run in his previous appearances. He struck out 3 in 2.2 innings. Reading was ineffective at the plate most of the night. They were retired in order in 6 of the first 8 innings. The bats finally woke up too late in the ninth. They got 4 of their 7 hits and scored both their runs on Rhys Hoskins’ 36th home run. Andrew Pullin (.346) had 2 hits in 4 AB. Scott Kingery stole his 3rd base. Mitch Walding had a double in 4 AB and is hitting a respectable .280. Phils’ batters struck out 14 times. Clearwater (76-53) Lost to Daytona, 11-4. Luke Leftwich (3-4, 5.01) and Austin Davis (5.56) combined to give up 5 earned runs, the defense gave up 6 unearned runs. The Threshers are 3.0 games behind the Blue Jays and 1.5 games behind Daytona. Their elimination number is seven. Of their remaining 9 games, they play 2 more in Daytona and finish with 4 against Dunedin. They still control their own destiny, but just barely. Lakewood (67-63) Beat West Virginia, 4-2. Time to break up the BlueClaws? That’s nine wins in a row and 12 out of their last 13. Sir Anthony shut down the Power for six innings and the BlueClaws built a 4-0 lead that the bull pen was able to protect. Seranthony Dominguez (4-2, 2.76) limited the Power to 4 hits and 2 walks. He struck out five. Jacob Waguespack (3.67) allowed the two runs that let the Power back into the game. Grant Dyer (2.95) came in to record a 6-out save, his second. Lakewood built their lead with Grenny Cumana’s RBI-single in the second, Jose Pujols’ and Damek Tomscha’s RBI singles in the third, and Edgar Cabral’s solo HR (1) in the fourth. Mark Laird had 2 hits, a walk, a SB (3) and a run scored. Damek Tomscha had 2 hits a run scored and an RBI. Williamsport (33-32) Lost to Brooklyn, 1-0. JoJo Romero tossed 6.0, one-run innings, but the one run he gave up was more than the Crosscutters could handle. Darick Hall and Brett Barbier had 2 hits apiece. Hall’s double was their only XBH. 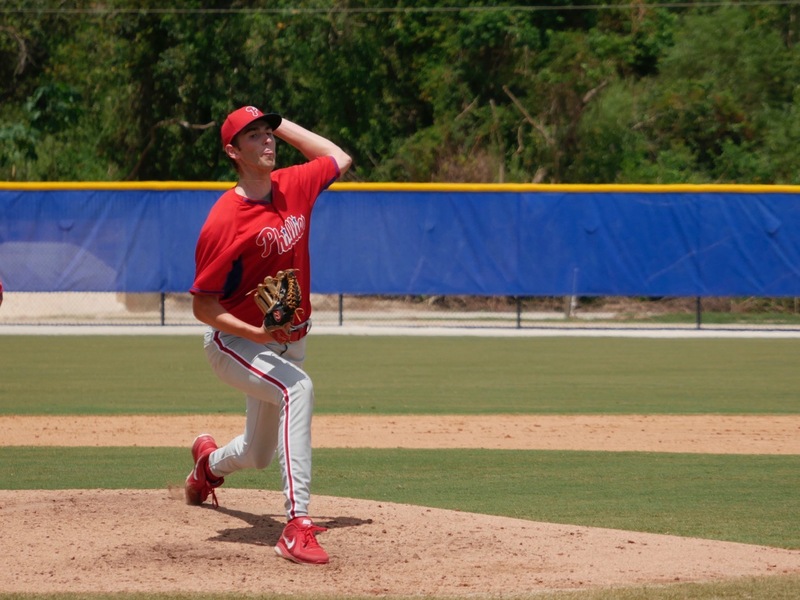 GCL Phillies (41-14, .745) Beat the GCL Tigers West, 3-2. Alec Asher pitched 2 rehab innings to start the game. He pitched two scoreless innings before turning the game over to Mauricio Llovera (4-0, 1.87). The stocky right-hander allowed just one run on 3 hits. He struck out 7 and walked NONE. Luis Gonzalez (4-1, 4.40) pitched 1-2-3 eighth inning. Jose Nin (1.08) came in to nail down his 7th save. He allowed a run on 3 hits before a visit by coach Mercado. He finished the inning with a double play an a fly out to right. The Phillies managed only 6 hits and struck out 12 times. they tied the game at one in the fifth inning on a wild pitch. The game remained tied until Josh Stephen launched a towering shot to right field. He hit the Tigers bus on the fly. For those of you familiar with Ashburn Field at the Complex, the bus was hidden behind the few trees behind the fence close to the batter’s eye in center. For some reason the driver decided to pull even with the flag pole in right. Afterward, the driver backed up before Moniak came to the plate. Josh Stephen crossing the plate after HR. Greeted by Daniel Brito who scored ahead of him and next batter Mickey Moniak. Daniel Brito (.291) returned to the line up today after 3 days off. He went 1-4. Rodolfo Duran (.319) tripled off the Tigers’ starter in the fifth and eventually scored on a wild pitch. It was a very efficiently played game. It was over in just over 2 hours. The Phillies are 20-4 in the month of August. #21 Jhailyn Ortiz (.236) DNP, again. It occurred to me when he was out of the line up for the second game in a row that he may have suffered a bruise of some sort Wednesday when he slid awkwardly, head first into third. He landed hard on his chest. Nothing serious, he was in uniform, but this would explain a second day of rest. Here are a couple photos from the Win over the Blue Jays on Wednesday. Kyle Young delivering a pitch. Mickey Moniak’s follow thru on his triple over the center fielder. All photos courtesy of Joe Kuhn. DSL Phillies (28-40) Postponed, rain again. DSL Phillies2 (42-28) Lost to the DSL Red Sox2, 6-3. 8/26 – Phillies recalled Jorge Alfaro from Reading. 8/26 – Reading activated C Joel Fisher from the 7-day DL. Eshelman pitched 147 innings last year between Cal State Fullerton and the Astros’ farm teams. He’s at 125 this year. He might be tiring. I don’t know. Interesting fact on him. He had 7 BBs in his last year at Cal State but he also had 7 WPs. He must have been bouncing some balls in the dirt to have the same number of WPs and BBs. CLW had an implosion of the entire pitching group. I think we can stick a fork in Casimiro for the season. Something’s not right about him. Either he has tired arm or the league has adjusted to him and is using him as a batting practice pitcher. Seranthony has given up ZERO runs in his last 15 IP and 1 run in his last 21 innings. He throws a clunker every once in a while ( 2 in his last 10 outings) but otherwise he’s very reliable. Nice time of year to have it all come together. One of Seranthony’s clunkers was his first start in Lakewood. Overall he’s been really good and is reported to have good stuff. He’s an easy top 30 prospect for me at this point. Mark Laird is really off to a great start in Lakewood. Its only been 22 games and about 80 ABs but his numbers are up across the board when compared to Williamsport. BB is almost 16% and he is sporting a .443 OBP. K rate is 8.5% and he is mixing in a few more extra base hits than in the past. Still only low A at 23 years old but I think he is doing his part to keep his name in the prospect mix this year. I consider Laird and Coppola interchangeable. Laird is hitting .356/440/.396 between a couple of rehab starts at Wmsprt and the rest at LKW. Coppola is .318/.403/.361 in 294 ABs between LKW and CLW. Coppola is a year younger and was taken in 13th round in 2015. Laird was a 9th round choice in the same draft. They are both fast and possess very little power. Laird probably has a little more power than Coppola. They both can hit well and beat out infield singles like there’s no tomorrow. If Laird wasn’t hurt, he would have started in LKW ahead of Coppola and would probably be in CLW now. Their numbers are so similar it’s spooky. I don’t think either one makes the top 30 but if they keep building off their numbers from the previous seasons, they could peak into our list. My first idea for a comp for both these guys was Peter Lavin but Pete had 10 times the power of these guys. Can they get bigger and gain some pop, let’s hope so. Nice post I agree, they seem like very similar profiles. I always liked Laird’s size/speed combo when I saw him on TV at LSU. He seemed like a pretty tall guy to be that fast. As you said can he get strong enough. It’s discouraging how poorly the Wsport group gas hit especially considering it’s mostly all college guys just drafted all hitting weakly. On the other hand, the young group at GCL has been amazing. Question – will Alfaro get a start tonight before being sent back down tomorrow? For some reason, every year when the LL World Series forces many away games at this time, the team never seems to be able to come through. It also seems possible thgat Martinelli and Hall are not the answer. However, look at Hoskins and Laird’s production in Williamsport. It was about the same. Go figure. long season for college kids starting back in February, no big deal. reading clinched playoff spot despite loss, and having lost 10 of last 15, so were popping corks after the game. those hartford yard goats deserve a trophy for being 11 games over .500 despite playing the entire season on the road. It’s hard not to feel the llove for Llovera. The guy’s been great all year and practically unhittable in his last 6 outings. In those 30 innings, he’s given up 15 hits (and had 5 in one of those games), 2 ERs, 35 Ks and 5 BBs (3 in the same game he gave up 5 hits). Opponents are hitting .205 against him for the season. Small chink in the armor is he’s 20 y/o but he’s a DSL guy so let’s keep an eye on him as he rises through the levels. And he;’s a little smallish in stature at 5’11” but he’s 200 lbs so if he throws with his legs he can generate the power to blow guys away. Is a “little smallish” redundant? I think so. Also kinda random and I don’t think he would be anything now but what ever happened to Ethan Martin? I know he was still in the org last year. Ethan retired in 2015 and has no stats post-2015. He had his 15 minutes of fame in the big leagues but never lived up to his 1st round reputation. EricD….last official transaction is he signed a minor league contract with hometown Braves in Dec 2015. Kevin Gowdy starts today for the Phillies. Dang! Today’s game in Lakeland is the only game of the final 8 I hadn’t planned on attending. Gowdy strikes out first batter in 1-2-3 inning. Well, he seems okay. I’m going to stop posting about him until tonight’s report. He pitched 1 inning. That’s all she wrote, Jim. Good report. I guess they’re easing Gowdy in. Any word on his upcoming off season activity since he missed time in the GCL? I’m 100% sure that he’ll be back for Instructs, as will all the 2016’s draft picks, 2016 NDFA, LA kids on the GCL roster, some kids from the DSL (especially the half dozen Venezuelans they signed), the kid that MLB declared a FA from Boston (Muzziotti? ), guys like Elniery Garcia who they will have learn a new pitch (Garcia’s coming back to work on a slider), the 5-7 guys going to the AFL (the week before they got to AZ), maybe a couple of the younger LA kids in Williamsport, and possibly Randolph from Lakewood. Maybe as many as 60 kids. Sorry a couple option years question. We are sending him down once AJ is here correct? Why does it make sense to use one Alfaro option years for a day or 2? Couldn’t we have just gone with just starting Rupp & not started Freddy (our emergency catcher) for those games? Or is there some rule where if a player is here for such a sort amount of time it doesn’t affect that? Another question does calling up some in September count as using one of a players option years? Here something to read on the options. Alvaro’s option was used back in April to send him to AA, all the moves now do is add small amounts of service time. Is Galvis the emergency catcher? I saw Blanco working out in Clearwater during spring training in catcher’s gear along with the other catchers, but not Galvis. I’m surprised there was no mention of the highlight of the GCL game- the post-game round table discussion at Legends with Jim P, Baseball Ross, and NYPhilsmaniac. Jose Pujols has already set two single season records at Lakewood…HRs and Strikeouts……the next record he can eclipse is RBIs……91 by Randy Ruiz in 2004….Pujols needs 13 more RBIs and he also has that record. Todd Zolecki reports Phillies will shut down Velasquez and Thompson probably within the next week or so with Asher and Buchanan likely to get the call. Why was Quinn pulled tonight? I was at the game tonight. I do not know why Quinn was pulled but I think it could have been injury. In the inning before they stopped the game after he slide back to first and didn’t get up after the ball went by the first baseman. The 3rd base coach came over to first base, but Quinn stayed in the game after that. When the Fightin Phils went back in the field Quinn had been replaced in center by KC Serna (who was playing SS earlier in the game). I dnt think it was a injury the pitcher tried to pick Quinn off and the ball hit him in the head. I hope the helmet absorb a good portion of the impact from the errant throw.